Rhys Bowen has penned an excellent family mystery that will have you turning the pages as quickly as possible. I fell in love this Bowen's writing when I discovered her cozy mystery series Her Royal Spyness. 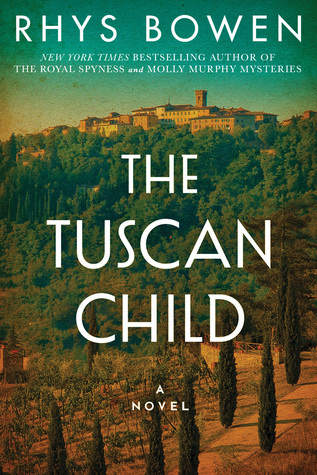 While I love that series, I felt the writing in The Tuscan Child was richer and more poignant. Sir Hugo Langley is shot down over the hills of German-occupied Tuscany during World War II. He is helped by a village woman who he falls in love with. When he dies in 1973, his daughter Joanna discovers a letter to the woman and references hiding their 'beautiful boy'. She had just discovered she had a half-brother from Hugo's first marriage and now she wonders if there is another brother no one knows about. Needing to get away to sort out what her next steps in life will be, she decides to travel to the village in Italy to see what else she can learn about her father's time there. In alternating chapters, the mystery slowly unfolds as we get a first-hand account from Hugo in 1944 and what Joanna discovers in 1973. I enjoyed both points-of-view equally. Often when stories are told in this fashion there is one or the other that is preferred and the reader feels anxious to get back to their favorite narrator. I never felt that way. I thought I would prefer the 1944 chapters since I love WWII set stories. But I loved the characters surrounding Joanna in 1973. The mystery is well paced with details being revealed in small pieces while developing the characters in both time periods. This allowed me to feel as if I was there in either period. While all appearances point to The Tuscan Child is a stand-alone novel, I could see it having a sequel - just because I love the characters and would like to see what comes of them as secrets from the past are revealed. If you love family history and unearthing stories that were never fully told, then The Tuscan Child is your kind of novel. I absolutely loved it. This is the second review I read of this novel and now I'm wanting to read it. I love stories with dual timelines and I also like the setting. Great review!